There's no need to go to Cirque Soleil to see high-flying feats, just go to a football game. 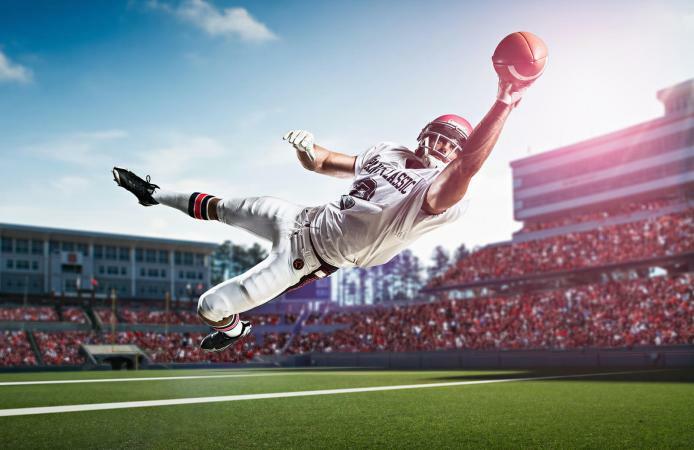 The best wide receivers in football have the ability to put on stunning acrobatic shows, including these ten catches that are considered by many to be the best catches of all time. No list of best catches in football would be respectable without mentioning the immaculate reception that occurred in the 1972 divisional playoff game between the Pittsburgh Steelers and the Oakland Raiders. 22 seconds remained on the clock in the AFC Divisional Playoff Game at Three Rivers Stadium and Pittsburgh trailed the Oakland Raiders by one point, 7-6. It was fourth down. Situated at the 40-yard line, they needed 10 yards for a first down. The Raiders rushed Pittsburgh quarterback Terry Bradshaw who fired the ball over the middle to John Fuqua. Fuqua and Raiders safety Jack Tatum reached the ball at the same time and the ball popped out. While the Raiders began to celebrate, Franco Harris had plucked the ball out of the air just before it hit the ground and started running down the left sideline. A few Raiders chased him but couldn't stop him from making a touchdown. After Pittsburgh kicked the extra point they led 13-7 with five seconds left in the game. With 51 seconds left in his team's quest for the NFC title, Joe Montana threw the ball to Dwight Clark who made a remarkable catch in the end zone to win the game for the 1982 San Francisco 49ers. It has since been recognized as one of the greatest catches in NFL history. In Super Bowl XLIX in 2015 when the Seattle Seahawks played the New England Patriots, Jermaine Kearse made a crucial clutch catch near the end zone. At first, as he leaped up to grab the ball, it slipped from his hands and it looked like a drop. But as he fell to the ground the ball bounced from his knees, around his lap, and back into his hands without ever touching the ground, and it was ruled a catch. It was such a stunning pass it made Tom Brady shake his head in disbelief. Lynn Swann's 64-yard catch against the Dallas Cowboys in Super Bowl X in 1976 is another historic feat. Swann tipped the ball to himself, twisted through the air and grabbed it before his feet hit the ground running for the winning touchdown. David Tyree leaped head and shoulders above the players around him and wrestled the ball from New England's Rodney Harrison. His catch kept the game alive and today it goes down as one of the best plays in Super Bowl history. Randy Moss, one of the great legends of the sport, is often considered the greatest receiver of all time (or one of the greatest, at least). His jaw-dropping one-handed catch against Darrelle Revis (who was at one point considered one of the best cornerbacks to play the game) is one for the history books. 7. Antonio Freeman's Unbelievable Catch Using His...Back? In what has to be one of the most amazing freak catches in NFL history, Antonio Freeman dives for a ball thrown by the legend himself Brett Favre. A defender seemingly knocks it down, and the broadcasters unceremoniously call it incomplete. But then Freeman springs back to his feet with the ball and runs in for a touchdown. The replay shows the ball bouncing off the defender, rolling around Freeman's back without touching the ground, then landing neatly into Freeman's hands. At the most crucial point of Super Bowl XLIII between the Pittsburgh Steelers and the Arizona Cardinals, Santonio Holmes caught a physics-defying catch mere inches from the boundary line in the end zone. Receivers must catch the ball and plant both feet in-bounds to score the touchdown. Holmes somehow executed a levitation trick as he balanced on his tippy toes while falling and reaching for a high pass, then pulling it in with care and precision as if he were catching a baby falling from a tree. It's no wonder it's recognized as one of the best ever. Many fans feel this play is the most impressive physical feat ever achieved by a receiver. Odell Beckham is going long for a touchdown. The ball is thrown a little too high, and he is facing the wrong way. Somehow Beckham leaps up, twists part of his body around while the rest of him stays facing the other direction, then extends his arm behind him so far it looks as if he will dislocate a shoulder. He does all this, then catches the ball one-handed while managing to remain in bounds. No wonder Jerry Rice said not even he could have made that kind of freakish catch. College football should not be left out. Recognized as the best college football catch ever caught on camera is Tyrone Prothro's catch behind the defensive player's helmet. He holds on to the ball as he is tackled and flipped, lands on his neck and somehow does not drop the ball. Besides being frequently ranked as the best college catch ever, Prothro's catch against Southern Mississippi was the official winner of the final Pontiac "Game Changing Performance" of the Year.